Ensuring the successful rollout of a Manufacturing Execution System (MES) requires an unambiguous specification that is understandable across disciplines, and which precisely describes all functional and technical system requirements. 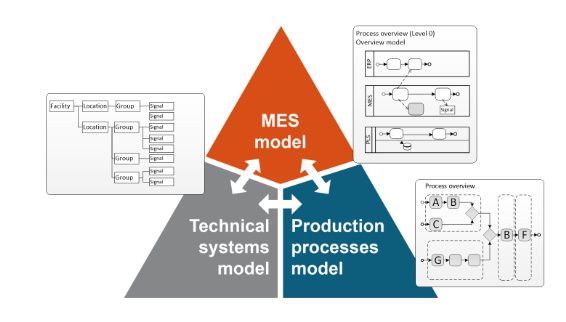 This is exactly what the Manufacturing Execution System - Modeling Language (MES-ML) provides – a graphical description language based on BPMN for requirements gathering and the specification of manufacturing execution systems. This closes the gap between IT and production. The description language for the production process and MES model is based on BPMN (Business Process Model and Notation), which in the past few years has developed into the de facto standard for business process management. Together with the Technical University of Munich and the Federal Ministry of Education and Research, we have developed MES-ML as a graphical description tool for modeling and specifying MES. We are available as a competent advisor for process modeling and description. Please contact us for further information.